The tug was launched in the presence of Capt. Cliff Brand, the Chief Executive Officer of RAK Ports, and Capt. Michael Magee, the Harbour Master of RAK Ports. Capt Brand highlighted in his speech the importance for the UAE economy to build “in the UAE for the UAE” and the added value of having the building yard around the corner for support during the lifetime of the vessel. Capt. Magee commented that this tug is an important addition to the fleet for the safe operation of Capesize vessels at the new terminal and added that he is impressed with the adaptability of Damen, the high quality of build and level of service. The ASD Tug 2913 tug for RAK Ports is the first of a series of ASD Tugs 2913 under construction at Albwardy Damen in the UAE. 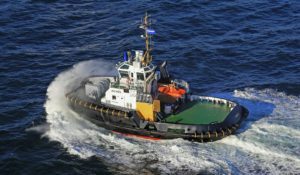 Consistent with the Damen philosophy, another three tugs of this type and a series of 60 and 70-tonne ASD Tugs are being built for stock. The stock construction enables the yard to offer well-proven vessels at very short notice to operators across the region and beyond. With the convenient location of Albwardy Damen, RAK Ports and all Damen clients can depend on a fast and efficient maintenance and repair service in the Arabian Gulf and its surrounding waters.